When it comes to cooking on a ceramic grill like the Gourmet Guru Grill, it’s important to learn HOW your grill cooks. With the Gourmet Guru Grill, you can cook your favorite foods using either direct heat, indirect heat, or a combination of the two. Most recipes you find online assume that the reader already understands these methods of cooking and how they should be used. However, those new to ceramic and kamado style grills, may not realize that there is even a difference. Check out how knowing the difference between direct and indirect heat can beef up your grilling game. Most people understand cooking with direct heat. You place the food directly on the grill above the heating source for it to be cooked. Cooking with direct heat allows your meat to get those fresh off-the-grill markings and to get that nice seared flavoring. The most popular foods to cook using direct heat include hamburgers, hotdogs, pork chops, and steaks. However, almost any food can be cooked using the direct heat method. The only drawback with this type of cooking is that the food can look like it is cooked but not be cooked evenly or all the way through. And depending on what you are cooking, it can also take a lot longer than you anticipated. Once you get the hang of using direct heat to cook on your Gourmet Guru Grill, you will learn how to crank up the heat to get a nice crispy sear and how to lower your heat or cook indirectly in order to get delicious, mouth-watering flavors from your food. Unlike direct heat, indirect heat cooks your food without the heat directly touching your food. In a ceramic grill or kamado grill, food cooked indirectly is usually placed on or above a deflector plate like the Guru Ceramic Plate Setter. This grilling accessory is what allows you to bake, roast, or smoke your dishes without the worry involved with using direct heat. 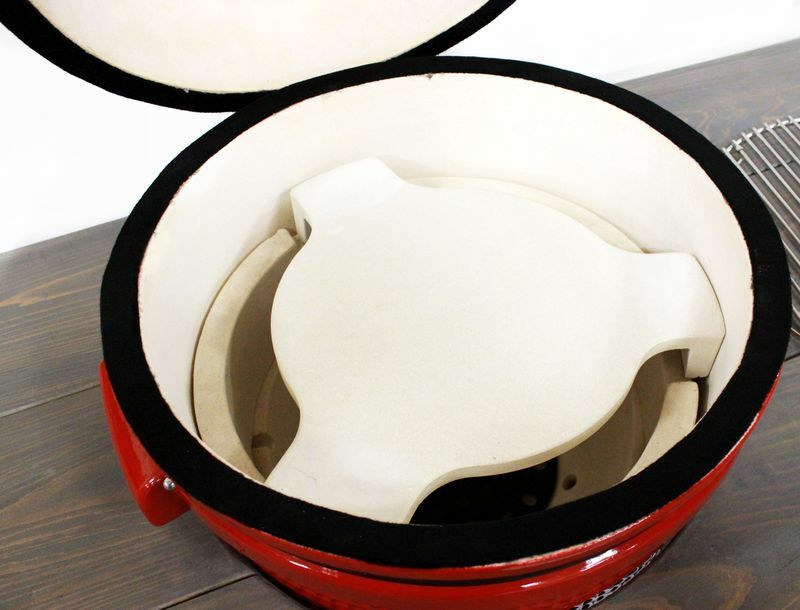 When using the plate setter, heat radiates throughout the closed dome and cooks food evenly. It may take a bit longer, but the time will be worth it when you take your first bite. Here are two different ways to cook chicken wings using indirect and direct heating methods. Try them both to see the difference between the two for yourself. 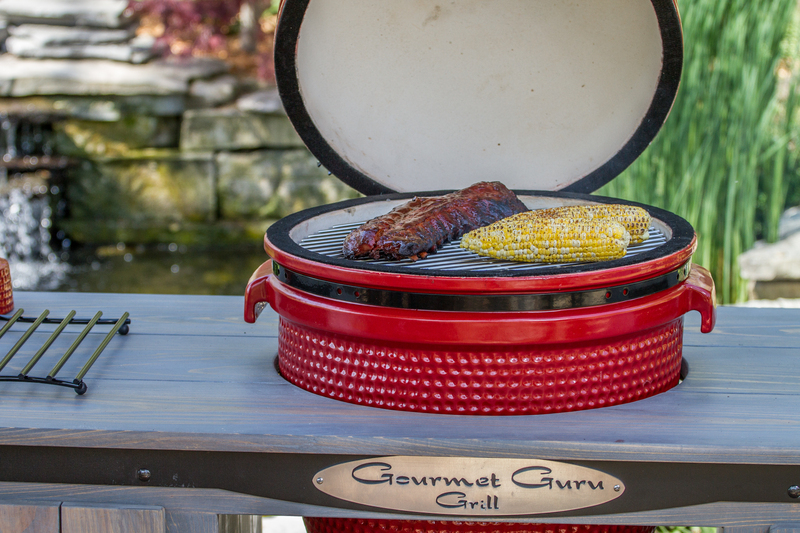 Playing around with different ceramic grill recipes and the different methods of cooking will also help you get comfortable with cooking on the Gourmet Guru Grill. - Lightly coat chicken wings with olive oil. - Using the indirect heat method, cook your wings for about 20 minutes at 250° F.
- After about 20 minutes, you need to increase your temperature to around 375° or a little bit higher for about 25 minutes. The higher the temp, the crispier your chicken wings will be. - Flip wings and continue to cook them at around 375° for another 15 minutes. - For those who like saucy wings: Some people like to sauce their wings and eat. Others like to coat wings in sauce and put them back on the grill. The choice is yours. - Lightly coat your chicken wings with olive oil. - Coat wings with your choice of seasonings or dry rub. - Add directly to grill for about 45 minutes at about 400° F.
- For those who like saucy wings: Some people like to sauce their wings and eat. Others like to coat the wings in sauce and put them back on the grill for about 10 more minutes. WHEN SHOULD YOU USE DIRECT OR INDIRECT HEAT? Choosing to cook with direct or indirect heat can be tricky. It all depends on what you are cooking and how you like your food to taste. However, when it comes to cooking on the Gourmet Guru Grill, we have found that mixing the two methods creates even better outcomes. Don’t be afraid to try the two different methods together or with different ceramic grill recipes. You may also want to try using different temperatures and different accessories. Understanding these two methods of grilling can really make a difference in how you use your grill and what you can cook. Don’t be afraid to take your skills to the next level. Get to grilling tonight and try out your new skills. Need a grill? You can shop on our website or find a Gourmet Guru Grill dealer near you. Just click on WHERE TO BUY to help you find a dealer and see for yourself why ceramic grills are a must have backyard accessory.